Vacationing tourists wanted for Glass Domed Utopia in Russian Freezer. Deep Beneath Siberia’s Frozen Tundra movers and shakers of the old soviet union maneuver to build their glass domed utopia. 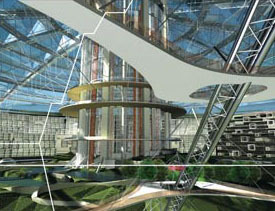 Planned for 2012 its designers envision Eco-City to populate 100,000 people. Plans were released last month by the Russians for the construction of the underground city in the Mir Diamond mine, the second largest hole on the Planet. At a quarter of a mile wide and over 1,700ft deep the site is planned as a multi-story megalopolis covered by a vast glass dome with natural light entering through the central core. Divided into 3 main levels of vertical farms, residency, recreational areas and forests Eco-City will be encapsulated by a photovoltaic glass dome that will harvest enough solar energy to power the complete development. 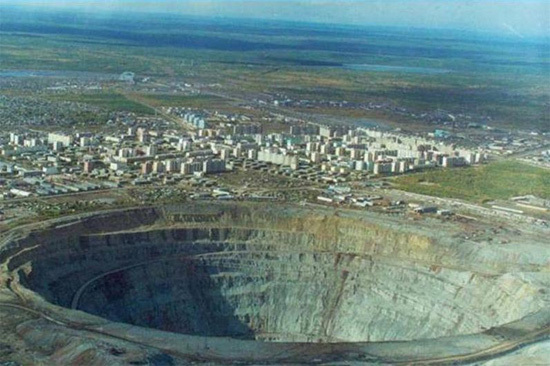 A once prosperous and thriving industry, demand for the Mirny mine’s superior-quality stones was so popular that diamond giant De Beers was forced to buy them to keep the market artificially inflated. When the mine closed in 2001, it left behind little more than a tiered hole in the ground reminiscent of some barren alien landscape. 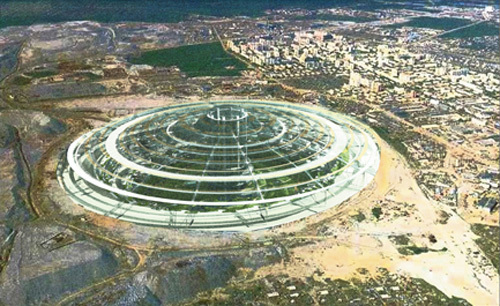 A group of architects from AB Elis Ltd. led by Nickolav Lvutemosiv want to transform the 2 million-square-meter space into a domed metropolis powered by a strong if not short term Siberian summer. The Siberian Winters make the landscape on the surface inhospitable, and in the Summer it fairs no better. the surface beneath the Earth is a natural insulator from the extreme temperatures, and offers unsurpassed protection and security. As fantastic as the concept may sound underground housing though novel, is neither new or unique. It was postulated by the science fiction writer Jules Verne in The Underground City and preceded J.R.R Tolkien in the Hobbit. Churchill followed during WWII along with the rest of England as they scurried to the Subways and The craft of constructing cities Underground has been quietly gaining momentum since. As it would have it , underground housing has become a trendy lifestyle choice in extreme environments such as the Australian outback, Tunisia, and North & South Poles. disasters, it offers resistance to extreme cold and heat, and to hurricanes and tornadoes and everything else nature can throw at the human race. But a more immediate advantage is its energy efficiency. Living underground can conserve up to 80 per cent in energy costs, while solar power can eliminate energy bills in their entirety. 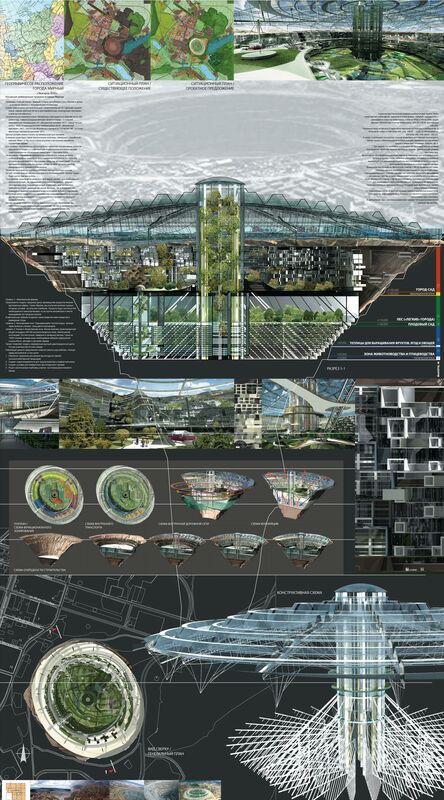 Eco-City could very well become the solution to alleviating the urban sprawl that threatens regional ecologies. Coupled with its carbon-neutral status, and year round growing season, the World has the makings of a perfect eco-solution for people and nature. It offers total privacy, security and earth is a natural sound absorber. What a perfect place to hide. Though one apparent downside may be the view or lack of, this is easily solved with skylights, light tubes and virtual windows, and internet cam feeds to provide any vista that piques the owners’ interest.